Have you ever woken up to a voice that came from nowhere? It has happened to me many times. In fact, it has gotten to a point that when I do hear it, I know enough not to complain but rather listen when it wakes me up in the middle of the night. No, I’m not crazy. I’m a believer. That’s right. I’ve become a faithful student of this all-knowing voice, my intuition. What I found when I stopped arguing with it is that the guidance it gives me always leads me onto my highest and best path. I recall being woken up by a Voice that seemed to have come from nowhere. Half asleep, I thought I was dreaming. When I turned over to my side to try to switch the channel of this bad dream, the voice repeated. Again it said, “Do stress management workshops.” This happened for a few weeks. When I stopped resisting it and started listening to it, my life became happier and more successful. Ever since I was a young girl, I’ve always loved making people feel good and the idea of teaching. This passion led me to becoming a nurse. As a nurse in the Boston area, I was able to help many people feel better. But after taking care of hundreds of patients with stress-related ailments, I knew that health prevention was important. I believed that it was integral in helping people feel better, but the only way to do that was through doing workshops in the community. This passion seemed to make sense, but I felt it was too farfetched for someone as introverted and afraid of public speaking as me. My long list of reasons why I couldn’t achieve this aspect of my dream triumphed until the voice started waking me up in the morning. I remember mornings when I would hear “Do stress management workshops” from the Voice, and I would try to silence it by putting my pillow over my head. Not surprisingly the pillow did not offer any sort of a sound barrier. Eventually, I stopped saying, “No, I don’t know how” or “Why me?” and started saying “How can I do it?” and “Where can I do it?” Although my heart somehow knew to trust this inner voice, my insecure mind wanted to challenge it. I would start testing the Voice by asking questions of how I can make this come true. Every time I would ask one, it would give me a simple answer. I started to believe it. Despite my nervousness about the whole idea, I knew that it was going to happen. Further, the more I believed, the more I really wanted it to happen. When I asked The Voice who I should contact and where can I offer the stress management workshops, it gave me the answers. At first, I could not believe it when it would answer me, but eventually, I got used to it. The Voice said, ask “Father O’Brien.” Also it said, “the convent” for the location. Coincidentally, at that time, the church was looking for a nurse practitioner to volunteer to take people’s blood pressure. 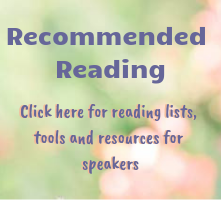 I thought I could offer my workshop along with taking other parishioners’ blood pressure as a way to do my workshop as well as build engagement in the church. I told myself that if Father O’Brien declined my offer then I would be done with trying to do any stress management workshops. Later that day, I hung up the phone in disbelief that Father O’Brien said yes, and I was on my way to start realizing my dream. To this day, I smile when I think about what happened and how it has led me to where I am now. Presently, I am the owner of Ultimate Healing Journey, a company that I founded almost 5 years ago that specializes in offering “happiness management” workshops. Instead of the stress management workshops that focuses on how negativity impacts our health and performance, my company focuses on the positive. My company purposely applies happiness skills to boost positivity. Positivity has been proven to enhance peak performance and productivity. I love what I do and I am so grateful that I followed the guidance that The Voice gave me. 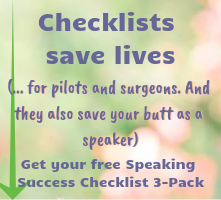 So how did I change from a “Nervous Nelly” of a nurse who was afraid of speaking in front of large groups to a happy-go-lucky international speaker? Well, I remained true to my heart’s desire and trusted The Voice inside of me—my intuition. 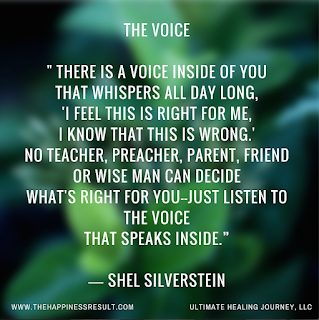 Although it took me years to be a speaker, author, coach, and facilitator, I believe that it all stemmed from my willingness to follow my dream and listen to my inner voice. My intuition is The Voice. As I wrote in my new book, The Happiness Result, “your inner GPS will always steer you towards your own North Star.” This book combines self-help, with science, and the power of intuition to inspire today’s busy people with ways to create the life of their dreams. Do you have a dream that you would like to come to fruition and just don’t know where to begin? I suggest you begin with following your own intuition. 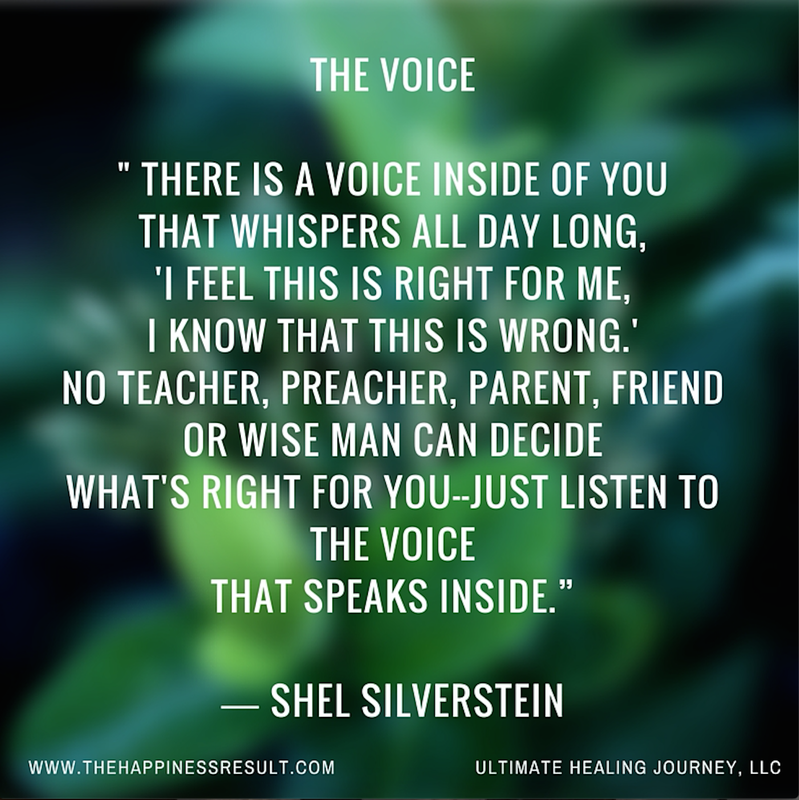 The Voice, your intuition, will steer you on your own magical path. If you have not had any experience with being woken up by The Voice, you can still follow your own North Star by tuning into the your still small voice from within. Here are 3 ways to get started. 1. Trust - Have faith that you have The Voice inside you. 2. Exercise - Build your intuitive muscle by talking to it, testing it, and tuning into its answers. 3. Love - Trust that your intuition is love-based. It speaks the language of your heart’s desires. Try following these 3 techniques to help learn how to trust and follow you own inner voice. The more you do it the more natural it will become. To learn more about how follow your heart’s desire and cultivate your inner voice visit www.TheHappinessResult.com today to preorder your copy of The Happiness Result: More time, More health, More love, More success. 7 Simple Techniques to Create Your A.W.E.S.O.M.E.™ Life today.